"Creative Technology Ltd today announced the launch of the Creative ZEN Style M300 music, photo and video player with Bluetooth wireless audio playback. Just 55 x 44 x 12 mm in size, the Creative ZEN Style M300 is packed with features including a microSD card slot and 1.45" TFT screen with Touch Buttons, and it is priced from only $39.99." If you're looking for a small MP3 player that doesn't cost a bunch, and is easy to carry/hold on your person (gym workout anyone?) then this new ZEN looks like a winner. 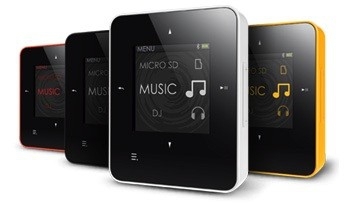 It comes in 4 GB, 8 GB or 16 GB sizes and can be expanded via microSD cards. Add in 20 hours of battery life and Bluetooth for wireless headphone support, and you have a compelling MP3 player - especially with prices running from $50 to $90. I just wish devices like this would sync with the Zune software - I don't even have my music loaded into Windows Media Player 12 any more, I use the Zune software for all music listening duties. Creative can make the best software in the world, but without a solid ecosystem of software and entertainment to go with it, they simply can't compete with Apple products.